Once you get your first taste of four-wheeled driving you will be hooked and craving to get back on the track every chance you get. To take your expedition to the next level you will need to bring some extra equipment with you so you can stay out there longer and attempt some tracks that you wouldn’t normally have the stomach for. With limited room in the back of your vehicle you may have the urge to just pile it all in there so that you can get going as soon as possible. However, when you’re out there and digging through a mountain of tools, you’ll wish you had invested in some 4WD drawers. 4WD storage draws allow you to organise your equipment in multiple roller drawers so that you can get the items you need with ease. They save an incredible amount of space- forget looking for your lunchbox in the back of the car, you’ll probably clear out enough room to add a fridge. But with so much information out there how do you choose the 4WD drawers that are right for you? 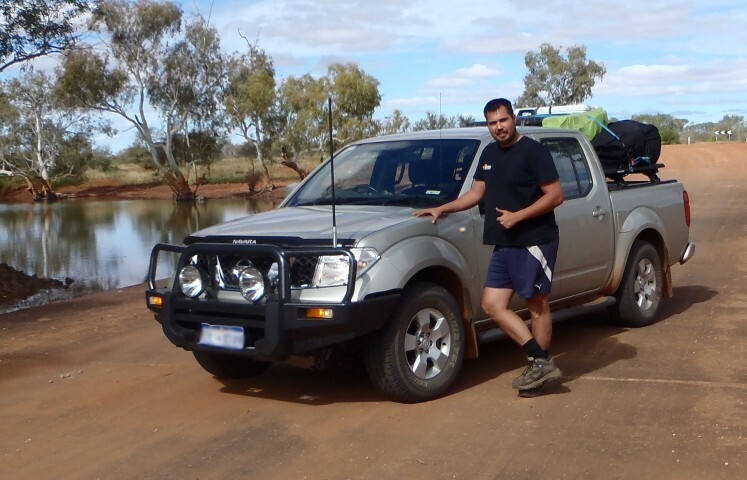 Let’s Getaway has created the ultimate guide to help you purchase your own set of 4WD drawers. We have broken down the process to its core so that you are fully aware of every detail you need to consider when you choose to buy a new set of 4WD drawers. Whether you’re a newbie getting started or a veteran that is after manufacturer recommendations, there is something here to help everyone. What 4WD Rear Storage Drawers Configuration Do I need? How Do You Install 4WD Rear Storage Drawers Kits At Home? Do I Need To Have A Fridge Slide For My 4WD Rear Storage Drawers? How Do You Stop Your 4WD Rear Storage Drawers From Rattling? 4WD storage drawers are a set (or sets) of sliding draws that are placed in the back of your 4WD and are a great addition to your vehicle if you are always up for a new expedition. They can be made from a variety of materials depending on the manufacturer and the price you want to spend. One of the key benefits of storage draws is they can be used to store all the essential offroading equipment you may require for a trip out of the dust and dirt, they also distribute the weight of your cargo so that the centre of gravity for your vehicle is lower than if you were to pack things on the roof. This allows your vehicle to stay on the ground rather than toppling over on certain tracks. While these drawers do have amazing benefits it can be difficult for newbies to get into the trend and understand what they need to pack and how to do it. We’re going to briefly address the fundamentals of 4WD drawers as well as what you should be packing in them. When you are looking into what configuration you should go for, it ultimately depends upon how you are planning to use them. Horizontal layouts are common for people who would like some extra storage space but also want to keep some room in the boot. Vertical layouts are preferred if you are going to incorporate a fridge slider or any other type of feature that requires a height ways layout. If you are only looking for storage you should also think about if you will require a double or single drawer. Single drawers are effective if you don’t require your equipment to be separated. Multiple drawers are the preferred choice if you certain equipment needs to go in certain places. Having several different compartments also allows you to have locks on them to keep your valuables safe. If you are a fan of multiple day trips you’re probably going to want some storage to accommodate your fridge and stove top and also have space when you can place a bed. You can also opt to get pull out kitchen benches for the chefs on the go and get shelves put into clothing. Once you have an idea in your head of what you are after, you can always contact some brands to get some ideas rolling for what is the best choice for you. After all, they are there to help you and will be more than happy to speak about what types of 4WD drawers they have to offer. A very important factor that you must make yourself aware with is the GVM of your vehicle. Gross Vehicle Mass (GVM) refers to the maximum weight that a vehicle can carry including itself in order to operate safely and efficiently. When you do decide to pack all of your compartments it is important that you don’t exceed your GVM. What material you choose will depend upon the weight of the vehicle and the budget you have to spend. Do your research on your own vehicle and understand what you need before you go out and make your purchase. During an impact, the static weight of your cargo can be 20 to 30 times its actual weight, which can cause severe injuries or even death to the occupants of the vehicle. When you are making your final 4WD drawer decision you want to be sure that they have been crash tested so that you know that you and your occupants will be safe during an impact. Storage drawers fall under there own Australian Design Rules (Drawer Systems ADR42/03) RVtradeandfleet.com.au provides a nice overview here . I personally would not buy a brand of storage draw that didn’t comply with the ADR code as you could void your insurance in an accident. Accidents do happen even to the best of drivers so it is always important to prioritise safety over any other feature. The sales support and warranty of your product is also an important factor when you are choosing 4WD drawers. You want to do your research and understand whether the system comes with just the basic consumer guarantee or does the company provide a longer warranty. Additionally,if you are buying your 4WD drawers online and are expecting a third party to install them for you, the installation may be the only thing that is covered by the warranty. Protecting yourself as a driver and a consumer are both important in the case that an accident does occur. If you are going to get a third party to install them for you, be sure to talk to them before you make the purchase to ensure that they are happy with the situation and that you are filled in about what you are covered for. The perks of having a fully tested 4WD drawer is that no matter what terrain you are trying to transverse, your gear stays where you put it. With this in mind,you should try to disperse the weight of your drawers evenly. Long 4WD drawers are a bonus as you can put your heavier items at the back which will be placed over the top of your axel. This will provide another benefit as the extra weight over your axel will help with bounce while you’re on the track. Newcomers to 4WD and their drawers are likely to overfill them with everything they can think of but this is the wrong way to approach them. In this scenario less is more and you’re likely to find local shops in the area if you need to restock on any supplies. Additional to the essentials that you are taking, you should also bring some safety gear and first aid kit if you encounter an emergency. Organisers and containers are a helpful trick to ensure that your items remain where they need to be and not mixed up with the wrong crowd. Longer drawers have heaps of room in them so separating items based on what they are will make the unpacking process a lot easier. You should aim to put fragile items such as food in containers so that they don’t end up all crushed by the time you’re done. Once you have familiarised yourself with the fundamentals of these instruments, the next step is to decide whether you will be making them yourself or if you will be purchasing them from a distributor. As we previously mentioned, different brands have different specialities so it is important that you know what you plan on doing before you jump head first. This next section will explore some popular 4WD drawers brands in Australia if you have decided to purchase them. One of the brands that we discovered on our search for 4WD drawers was Drifta camping & 4WD. Drifta is able to create their drawers and even kitchen setups to match any type of vehicle. They have the internal dimensions of every kind of 4×4 unit you can think of while also being able to create custom sizes. If like me, you have already purchased a fridge and stove top for your vehicle, it would be a shame to have to replace them to fit a new storage space. I contacted Drifta about my concern and they were able to make a minor adjustment to their design to accommodate my needs for a small fee. They also utilises Teflon runners for their drawers to assist them in sliding easier. Long term bearing runners can become stuck and hard to use. Teflon allows you to use your drawers with ease after many trips with them still sliding like new. Additionally, Teflon is lighter and more compact than other materials, which is great for runs where you need to limit your weight. The material is also more cost effective than traditional means. After a years’ worth of abuse with washouts, sand dunes and other tough situations the Drifta draws managed to pull through with little to no concerns. Some little limitations included that the drawers would fall out if you pull them too far. This means that if you have filled them to the brim, you’re gonna have a bad time trying to get them back in. A simple solution I found, however, was going down to your local Bunnings and grabbing some paracord to secure the ends. It’ll set you back only $30 and will definitely help you out in the long run. At the end of the day, these drawers did exactly what I needed them to do. They are a great investment for any 4WD enthusiast and come with a lifetime warranty if you are concerned with shelling out a large amount of money. 4WD Interiors is one of the longest running outback accessory providers. They have been operating since 1980 and have built themselves an impressive reputation on high quality and durable products. If their impressive long run isn’t enough to get you interested they have also won several awards which included the “Best Aftermarket Product Award from 4×4 Australia in 2000”. The reason they have been around so long and that they continue to win so many awards is all the added features that their products have. All of their 4WD drawers come with handle slam latches and levers to ensure that your drawers stay open when you are loading and can also be set to shut when you don’t need them out. The slides of their drawers also come with side bearings to prevent horizontal shift and anti-rattle guards to reduce the noise of your unit even more. If you have kids that you are planning on taking to the tracks the drawers also feature a couple of safety benefits for the little ones. Firstly there is a hand gap above all of the drawers to ensure no hands are caught in the crossfire when they are shutting. Additionally, they also come with anchor points and child restraint anchor points to make sure that everyone stays in the car no matter how bumpy it gets. The main reason why my mates have been using 4WD Interiors and raving about them for years is how easy to use their website and products are. When you land on their home page you are greeted with an easy to use feature that tells you to put in the make, model, series and year of your vehicle. 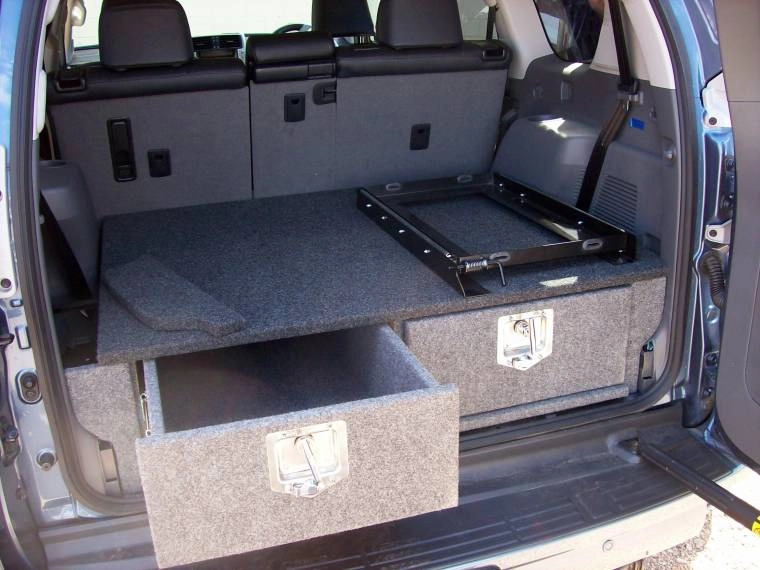 From there you will have access to the 4WD drawers that are ready to go and specifically made for your vehicle. If it’s missing a little something that you are after, you can also go through the addons list to get what you need. The products that these guys make are also super easy to be installed from home. A lot of my mates that are looking at doing a half DIY job will order a single piece from 4WD Interiors and then finish their build around that main part. Offroad systems know how important it is to have yourself a good set of drawers in the back. You don’t want to be scurrying around looking for toilet paper when nature calls. And you definitely don’t want to be trying to find the first aid kit under a mountain of tools in the case of emergency. With this in mind, Offroad systems have built their draws to remain organised and lightweight. The Aussie made and owned company provide a wide range of products that can appeal to any and every kind of 4WD vehicle. Their focus is providing a top quality product for the market rather than pushing for their own bottom line. With GVM becoming smaller and smaller with every modern vehicle, Offroad systems are dedicated to helping 4WD enthusiasts get some high-quality drawers without sacrificing the weight of their vehicle. The systems this company has put together are a part of the Superlight Series which utilises a combination of aluminium and plywood. The aluminium makes up the drawer while waterproof and lightweight plywood reduces the weight of the rigs even further. With the high investment in light weight you may be thinking that the strength would sacrifice but that’s not the case. The Superlight Series is rated to carry the same amount of weight as common galvanised steel drawers that are on the market. A number of people that I know can vouch for the Superlight Series as they have switched from other brands to save weight for the vehicles. While your GVM does get some wiggle room, another benefit that they have noticed is that their vehicles also use less fuel. With the rising cost of diesel and petrol, any little bit of money that you can save on fuel is welcomed. With many people opting for DIY builds, Offroad Systems can also accommodate in providing some assistance. They can supply kits for those who need a bit more guidance and also sell the individuals parts such as liners and handles for the more bold. If you are looking for a super lightweight build, Offroad Systems should definitely be considered when you are making your decision. 4WD Supacentre makes its way onto our ultimate guide as their products are renowned for being easy to use and install. If you’re looking at getting a really cost effective unit with all the capabilities of the big price tag, this place is for you. The Titan double draw tray that they offer is easily installed at home taking approximately 3 hours top to get it all in. Everything you need to install the unit comes with the kit so you don’t have to worry about not having the proper tools at home. The kit also includes a sliding tray with anchor points for fridges and can accommodate for appliances that are up to 80 litres. It really is the perfect solution to keep the back of your ute looking neat and tidy if you are on a budget. With heavy duty locks and handles, it can quickly become a tradie’s best mate. The kit is made from galvanised steel which can affect your total vehicle weight but is made for endurance and durability. If you are searching for a drawer that is a bit more heavy duty this may be what you are looking for. While there are some good things to say about the Titan draws from 4WD Supacentre, it also does come with a few limitations. To start off with the quality of this product isn’t near the same standard as the previously mentioned brands. This is definitely evident in the price you pay which is currently sitting atjust under $500. We chose to mention 4WD Supacentre’s line of drawers as they are a good starting point for newbies that have no idea where to start or what drawers should look like. Additionally, after testing out the rig for a couple of days, I noticed that the catch for the fridge was a bit loose which can get a bit worrying for the real rough tracks that you may be attempting. On top of that the delivery method wasn’t too bad as they had to ship out the order but it wasn’t shipped as one unit. Each individual section of the drawers came in its own box which led to me waiting a bit longer for the wing set with everything else waiting around and ready to go. Overall this line of 4WD drawers is very cost effective for what you get and is more suited for day to day driving rather than actual 4WD tracks and expedition. This is mainly due to the lack of customisation which includes the unit only coming in steel which can hurt your GVM. If you are up for the challenge and would prefer to build your drawers yourself then pay close attention. Firstly you need to understand the pros and cons of building your own drawers opposed to buying them. This simple list will be the basis for your final decision as you should be cross checking each merit and drawback with your budget and what you plan to do with the system. If you’ve weighed the pros and cons and still want to continue your next step will be choosing a material. We previously touched on what type of materials you can use but didn’t go into further detail about the situations that they are used. Plywood is one of the lightest and cost-effective materials that you can use. Due to how cheap it is and how easy it is to use, most people tend to use plywood on their first builds. It is also effective at absorbing sound that dampens any loud noises. Additionally, many people that are up for creating their own set of drawers will have experience with wood and lumber in the past. However, not many people have the tools and experience necessary to weld. Aluminium can be stronger than wood in some situations and is also lighter. The drawback to using aluminium is that it can be very expensive and can rattle a lot in the back of your vehicle. As previously noted it is a lot harder to work with aluminium that wood as not everyone has access to the tools required. Steel is the strongest of the trio but is also very heavy. This type of material can be quite easy to find as most material distributors will have some in stock. Alternatively, you can look at scrap yards to see if they have any pieces that are worth salvaging. A downside to using steel is that it makes the most noise of its counterparts which can be very irritating on bumpy tracks. You should assess your needs and budget before you make the decision on what material you are going to use. A lot of DIY builds also include a combination of several materials to give them their desired outcome. A common example is using steel to create the frame of the draws and using plywood for the walls of the cupboards. Add some upholstery or carpet to the outside of your drawers and you are good to go. DIY kits for you to install at home are generally easy to install. The point of these kits is to help you get on your way as soon as possible by making the kit easy to assemble and fit to your vehicle. Some kits come with all the tools you need while other only need the basics to get you going. Generally speaking the steps involved in installing these units follows the procedure of; removing the walls of the unit, plan where you will be mounting the unit, lift the system into your vehicle, anchor it down, add the walls back along with the actual drawers. You’ve heard of these rigs with their fancy pull out fridge panel but do you really need it? The short answer is no. They exist for some rigs because their simply isn’t enough room in their boots to access the fridge while it is in the back. The sliding table allows them to be able to use their fridge rather than it sitting there and sucking power. If your vehicle is able to have a fridge in the back and can open while it is still in your car, you don’t need one at all. A recommendation would be to get one however if you have to stand on the tail guard to be able to get into it. Your drawer slides rattling depends upon the style, series and lock that you have chosen to go for. For this reason many distributors tend to use compression locks to dampen the noise of your rig when you are traversing harsh terrain. If your rig is already making noise here are some quick and easy ways to reduce the noise. Horizontal bearings and non-locking sides stops your draws from moving side to side which tends to make a racket otherwise. Applying a material such as foam tape to the back of certain runners works very well when trying to absorb excess noise. Running strips of foam tape at the back of your drawers also works well to stop the movement they have when you are driving about. If you don’t have access to foam tape for any of these techniques, other soft materials that are generally good at cushioning will work just as good.